The ESE Series Ethernet slip ring is a rotating assembly used to transfer power, control circuits or data (analog / digital) from stationary inlets to rotating outlets. 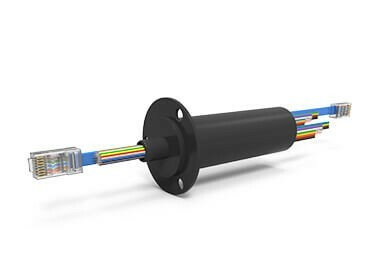 ESE Series slip rings provide 100Base-T or 1000Base-T Ethernet connections with a combination of 2, 5, and 10 amp power connections. Utilizing high performance gold-on-gold contacts, the ESE Series features low electrical noise and Ethernet cables terminated with RJ45 connectors. Standard models are available from 8 to 51 circuits. For more information, see ESE Series Electrical Slip Rings.